Is it possible that there is a completely unknown civilization living beneath the surface of our planet? 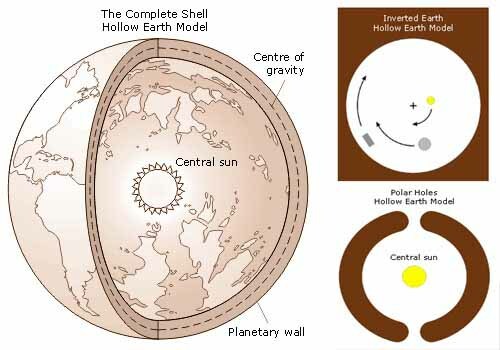 Many people believe that the Hollow Earth theory is more than just a myth, and some have even tried to prove it scientifically. Even today, in the 21st century, it’s difficult to say with certainty that it does or does not exist. Is there a hole in the North Pole? In the early 1970’s, ESSA, a project belonging to the Department of Commerce of the United States, gave media access to images of the North Pole taken by the ESSA-7 satellite on November 23, 1968. One of the photographs showed the North Pole covered by the usual cloud; the other one showed the same area without clouds, revealing a huge hole where the pole was supposed to be located. Vice Admiral Richard E. Byrd of the US Navy was a distinguished pioneer aviator and polar explorer who flew over the North Pole on May 9, 1926 and led numerous expeditions to Antarctica, including a flight over the South Pole on 29 November 1929. Between 1946 and 1947, he and his team carried out a large-scale operation called “High Jump”, during which he discovered and mapped 1,390,000 km² of the Antarctic territory. The famous Byrd expeditions first entered in dispute of the hollow Earth theories when several articles and books like Worlds beyond the Polesby Amadeo Giannini claimed that Byrd had not flown over the Pole but inwardly through large holes leading into the Earth. The possibility that the earth is hollow, and that it can be accessed through the North and South poles, and that secret civilizations flourish within it, has spurred the imagination of people through centuries. Evidence of this we find in the history of countless ancient civilizations. The Babylonian hero Gilgamesh visited his ancestor Utnapishtim in the bowels of the earth; in Greek mythology, Orpheus tries to rescue Eurydice from the underground hell; it was said that the Pharaohs of Egypt communicated with the underworld, which could be accessed via secret tunnels hidden in the pyramids; and Buddhists believed (and still believe) that millions of people live in Agharta, an underground paradise ruled by the king of the world. A map of the third Reich shows several secret passages depicted which were used by German U-Boats to access mysterious underground regions, as well as a complete map of both hemispheres and the mysterious kingdom of Agartha. Karl Unger a crew member aboard a U-Boat commanded by Heinrich Brodda wrote letters stating that the crew had reached the interior of the Earth and that they did not consider coming back. In the incredible maps of the Third Reich, the Antarctic continent can be observed without its thick layer of ice. But the most intriguing detail are the presence of underwater passages spanning across the entire continent and seem to converge at the exact location which is identified as the opening towards the Hollow Earth or Inner Earth. Their legends speak of an entrance into Earth. Until the year 1907, the Macuxies would enter some sort of cavern, and travel from 13 to 15 days until they reached the interior. It is there, “at the other side of the world, in the inner Earth” is where the Giants live, creatures that have around 3-4 meters in height. Oh and… There is a huge Ocean beneath the surface of our planet. Scientists have not long ago, discovered a large ocean of water inside the mantle of Earth, and they point out that it is a large water “tank” that could fill the oceans on Earth three times. This incredible discovery suggests that the surface water of the planet came from within Earth, as part of a “complete water cycle on the planet” instead of the dominant theory proposed that water arrived to Earth by icy comets that passed by the planet millions of years ago. Thank you for this, it is fascinating and why not?! There is no reason not to believe the possibility of such an incredible discovery i am speechless, but i am nothing…..